Hello! My name is Savannah Knighton and I’m currently serving as the chair of NATA Student Leadership Committee. 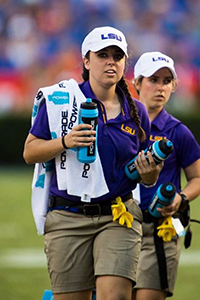 I’m a senior athletic training student at Louisiana State University. This is my second year serving on the committee, as last year I represented District Nine. Our committee consists of 10 representatives, one from each district – including yours! We are all athletic training students just like you. The SLC, under the guidance of our three mentors – Chris Ludwig, EdD, ATC, Michael Goldenberg, MS, ATC, and Mary Murray, EdD, ATC – and our board liaison – District Nine Director Marisa Brunett, MS, LAT, ATC – conducts a number of projects throughout the year. The SLC’s main focus is the Athletic Training Student Seminar, held annually at the NATA convention. Our committee is responsible for choosing the ATSS theme and topics of the presentations, contacting speakers and organizing the event. We also hold webinars and contests throughout the year, and have interactive social media presence, plus much more! We are here to provide a voice for all athletic training students, so don’t hesitate to reach out to your representative, or myself, with questions, comments, or desires to get involved. We would love to hear from you! If you’re not doing so already, follow us on social media: Facebook, Instagram and Twitter. Alex Raifsnider is from Wolfeboro, New Hampshire, and attends Plymouth State University. Her favorite clinical rotation so far has been men's lacrosse. "The team was super supportive of letting students get hands on experience and letting us improve our skills,” she said. “The high-intensity nature of the game allowed for a wide range of injuries that gave us students a challenging clinical experience." Her dream job is to work at a sports medicine clinic. A fun fact about Alex? She has red hair and blue eyes, which is the rarest genetic combination to have. 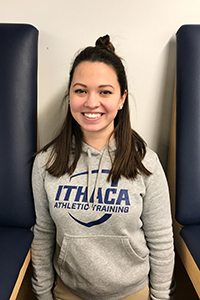 Katelyn Dolan is from Brewster, New York, and attends Ithaca College in New York. 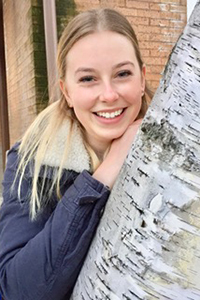 Katelyn's favorite clinical rotation was with her school's football team because "of the chaotic, fast-paced environment that kept me on my toes, and constantly learning new things," she said. Her dream job is to be an AT for the NFL. A fun fact about Katelyn? She has medaled in weightlifting competitions. Nick Saul is from Lisle, Illinois, but is a part of the first MSAT class at High Point University in North Carolina. 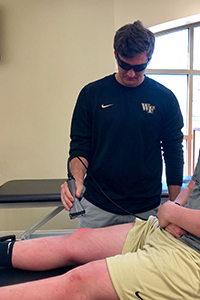 His favorite clinical rotation was Wake Forest University track and field because he was able to apply what he was learning in the classroom to the clinical setting. Nick's dream job is working as an AT for Power Five Football. A fun fact about Nick is that he comes from a family full of boys! He is the middle child of his brothers, Tim and Andy. 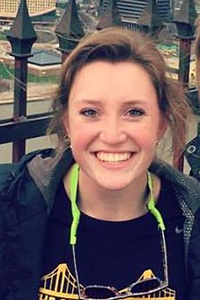 Emily Mulkey attends The Ohio State University. When asked about her favorite clinical experience, she said, "I have loved them all... football, track and field, wrestling (Big10 Champs), rec sports with The Best Damn Band in the Land (TBDBITL – our marching band), and probably my favorite, The Columbus Crew full-year internship with MLS soccer." Emily has her goals set high as she wants to represent team USA at the Olympics someday. Even though Emily loves The Ohio State through and through, she is still southern at heart and loves everything Seersucker. Joseph Lewis is a student at Washburn University in Topeka, Kanas. His favorite clinical rotation was with the Washburn's women's soccer team. His dream job is to be a physician's assistant at a sports medicine clinic. Something interesting about Joey is that he has Tourette syndrome. 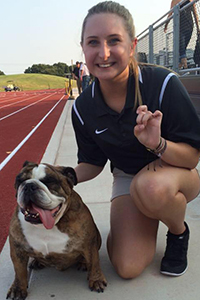 Brittnie Smithley is from Pearland, Texas, and she attends Texas Lutheran University. Her favorite clinical rotation has been with the San Antonio Fire Department. "It was refreshing to work in an emerging setting with these tactical athletes,” she said. “Being placed in such a unique clinical setting challenged me to incorporate goals and activities into my treatments and rehabilitation that I wouldn't normally consider." Brittnie's dream job is to work in a physician setting, preferably being the first assistant to an orthopedic surgeon. A fun fact about Brittnie is that she loves to bake. "It's fun to do, usually tastes amazing, and I love to make peoples' day by sharing my creations," she said. 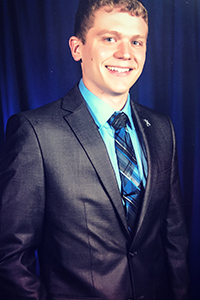 Jacob Arnold is from Tempe, Arizona, and attends Northern Arizona University Phoenix Biomedical Campus. Jacob's favorite clinical rotation has been the one he's with right now: the men's hockey team at Arizona State University. His dream job is to be the head AT for a NCAA Division I football team. 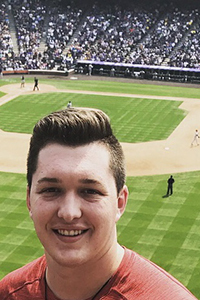 A fun fact about Jacob is that he loves baseball. He played for the club baseball team at Arizona State all four years of his undergrad. 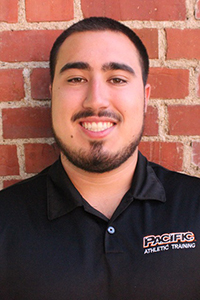 Iancarlos Morales is from Gustine, California, and he attends the University of the Pacific. What has been Iancarlos's favorite clinical rotation? "Men's soccer has been my favorite personally,” he said. “The athletes I get to work with are humble and willing to strive. They made me feel as if I was actually part of their team. I was able to join their practice warm-ups as well." Iancarlos's dream job is to work with a professional sports team. Even though he loves athletic training, Iancarlos doesn't have a favorite sports team. Marisha Little attends the University of West Florida. Her favorite clinical rotation was working with the Navarre High School football team. Her dream job would be working in public health and community outreach. 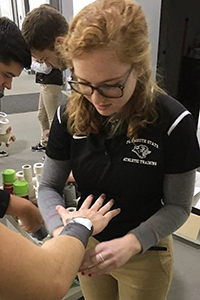 “I would like to find a position where I am able to help expand the reach of our profession to help provide athletic training services to those who do not currently have them,” she said. 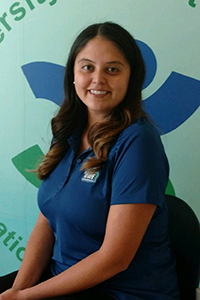 “I am particularly interested in working to bring athletic training services to Native American communities.” A fun fact about Marisha is she’s officially a Lady of Lochaber – she owns a tiny plot of land in Scotland (1 foot by 1 foot, to be exact). Madelyn Barton is from Seattle, Washington. Her favorite clinical rotation was at Ballard High School in Seattle because it's where she learned to love athletic training. Madelyn aspires to become Rick Griffin, the head AT for the Seattle Mariners. "I am a huge Seattle Mariners fan,” she said. “I wanted to be a baseball player growing up, now I want to take care of them." Savannah Knighton lives in Pottstown, Pennsylvania, but attends Louisiana State University. "My favorite clinical rotation was LSU volleyball because it was my first experience working with a team, and my preceptor and older student really took the time to teach me," she said. What's Savannah's dream job? "It would be working for a university as a certified athletic trainer, but specifically working within research. I would love to be able to design my own studies utilizing the athletes at my university," she said. Even though tigers are near and dear to LSU, Savannah has an English bulldog that loves to slobber. We hope you enjoy these initiatives and connect with the SLC! Our social media accounts are always active, and we hope to interact with you and your program. Tag us and ask us questions, or shoot us a photo to be featured on one of our social media channels! However we can best support and be a voice for students, we hope to be that. Don’t hesitate to reach out to us on social media or at slcoutreachcom@gmail.com. All the best in the coming semester and clinical rotations! It is an honor as a mentor to work with such a great group of student leaders. I would suggest students contact their representative if they have any questions about the SLC or want more information on what this group does for them.